A bunch of cops decide to go vigilante after one of their own is murdered by a group of gangsters. 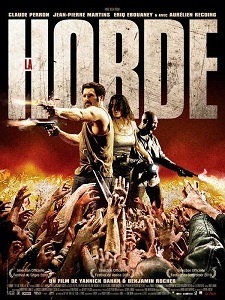 They raid a tower block in the ghetto with disastrous results, but before anyone can decide what to do, a horde of zombies attacks. An unlikely alliance forms as the cops and gangsters battle for survival against the undead. This is gritty, action-packed stuff with lots of violent carnage at every turn. This is a good-looking film that doesn't pause for breath. The direction is skilled, the gore flies thick and fast, and the writers produced a tight script - they clearly didn't feel the need for a lot of exposition. It's in French, but that's really no impediment in this kind of movie, zombies sound the same in every language.